3r883 RETURN OF THE JEDI dated teaser 1sh 1983 George Lucas' Revenge of the Jedi, Drew Struzan art! Sold For: Login or Register to see sold price. NOTE: Click on linked names to see a biography. Important Added Info: Note that just about everyone knows that this movie was ultimately titled "Return of the Jedi", but that it had the original working title of "Revenge of the Jedi". Teaser posters were made with the working title, and they were made in both a dated and undated version. 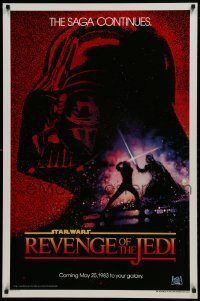 There are many reproductions of both versions, but we have carefully examined this poster, and we are 100% certain that it is an original dated "Revenge of the Jedi" teaser one-sheet (the poster measures exactly 27 1/8" x 41")! Condition: very good to fine. The poster was never folded. It has a few light creases scattered in just a few areas, but they are not very noticeable or distracting, and overall it is in absolutely fantastic condition!